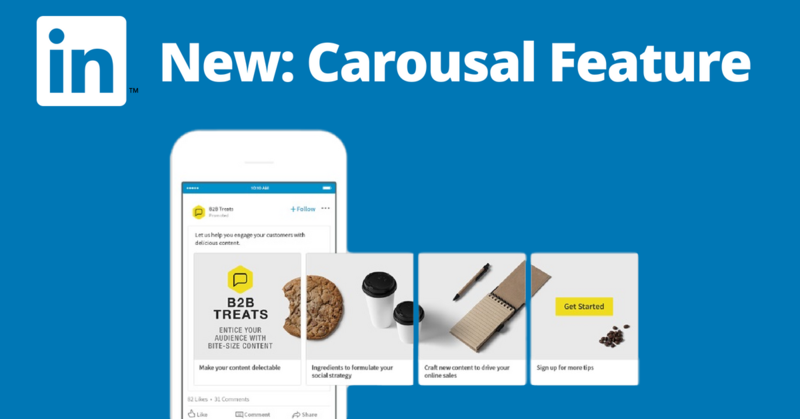 LinkedIn has continued to develop as a social platform, now offering a carousel feature for sponsored content. Carousels are very popular on both Facebook and Instagram. The format of the feature is virtually identical to what you would be familiar with from other platforms. There is a limit of 10 cards (images) available per carousel ad – with a customisable message available for each image. This new feature just adds arsenal to LinkedIn marketers when using the platform which has been regarded as the B2B marketing king! They look pretty cool, stand out in the feed, so they sure are something to keep in mind next time you want to run an ad on LinkedIn.